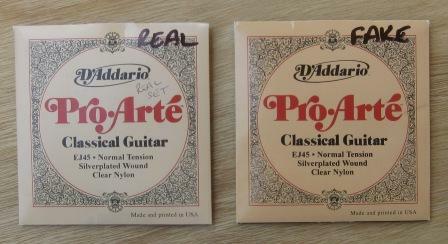 In April 2012, I purchased three sets of D’Addario EJ45 Pro-Arte nylon, normal tension, classical guitar strings off eBay. Unfortunately, it turns out that they were counterfeit. Despite the low price of the guitar strings on eBay, I never contemplated that someone would bother copying and selling a low value item such as guitar strings. As a result, I thought I was buying authentic D’Addario guitar strings. When I opened up the guitar string packaging, all seemed normal. You would never tell from a superficial look at the packaging that the guitar strings were counterfeit. I strung one of my children’s Jose Ferrer El Primo classical nylon-string guitars (review here) with one set of the strings and it became clear that the EJ45 Pro-Arte guitar strings were not the real deal. The sound was not as clear as a genuine set of D’Addario guitar strings. What was even more noticeable was how quickly the strings went out of tune. Basically, the EJ45 Pro-Arte guitar strings were not playable. 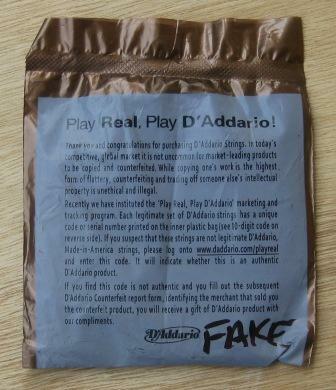 It seems that D’Addario has had a problem with counterfeit strings. The packaging of authentic strings now carries a serial code which you can enter into the Real Play web site (link is on the home page of the D’Addario web site) to validate that the strings are legitimate. Before using the strings, out of curiosity rather than any suspicion that the guitar strings may be counterfeit, I entered the serial number into the Real Play web site. I noted that all three sets of guitar strings had the same number printed on the packaging. Please note that the serial number you entered is an authentic code in our database, but has already been entered by another user. Therefore, it is possible that the product is counterfeit. We would appreciate your help by providing more information. Please select the Report Counterfeit button below, and a member of the D’Addario Consumer Services team will be in contact with you shortly. Thank you for your support of Genuine D’Addario products. 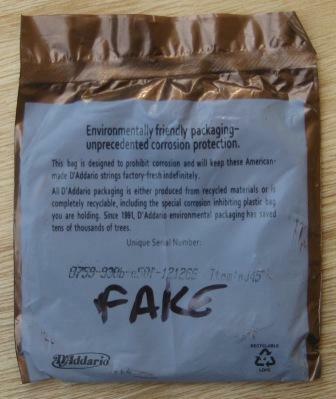 I reported the counterfeit guitar strings and a member of the D’Addario Consumer Services Team contacted me requesting photos of the strings and their packaging. I emailed them the information that was requested. For helping us with our anti-counterfeit efforts, we would like to send you a complimentary set of strings. If we deem the strings counterfeit, we will send you two complimentary sets of strings. I have removed the counterfeit D’Addario EJ45 Pro-Arte strings from the guitar. I have also thrown away the remaining two sets of guitar strings that I purchased. I still use D’Addario strings on the three acoustic and two classical guitars that I currently own, but make sure that I purchase from reputable retailers. I always enter the serial number on the Real Play web site. The eBay seller I purchased the guitar strings from is no longer selling guitar strings. I am not sure whether my reporting the counterfeit strings had anything to do with it as I have not had any further contact from D’Addario. Please share this with other guitar players that you know. I wasted my money and time restringing my guitar with counterfeit strings. Hopefully by sharing this it will help others to not make the same mistake. Rex, I am a representative from D’Addario. Please contact me as I am not sure why you didn’t receive your string sets. We certainly do send to Australian and I want to make sure you get them. Please use the email I provided and we will take care of this right away. Thanks Brian. I have sent you an e-mail. Rex. This is very interesting, You are an excessively professional blogger. I have joined your feed and sit up for searching for more of your wonderful post. Additionally, I have shared your site in my social networks!